When out hiking I have seen many off-shore wind-turbines, huge industrial structures, not very nature-friendly, but they are creating sustainable electricity, and electricity is something more and more hikers are depending on out on the trails. In the future this will be even more necessary as maps and networks all will be digitized. But there are also other things that is good about creating solutions for hikers to charge their devices along the trails. If there is free charging of gear in the designated camp-areas people will be more likely to use them, and it will create a synergy where social life, thrive, hikers relating and being aware of other hikers will make both the trail-life better, and the problem of litter, accidents, forest fires etc. less a risk. 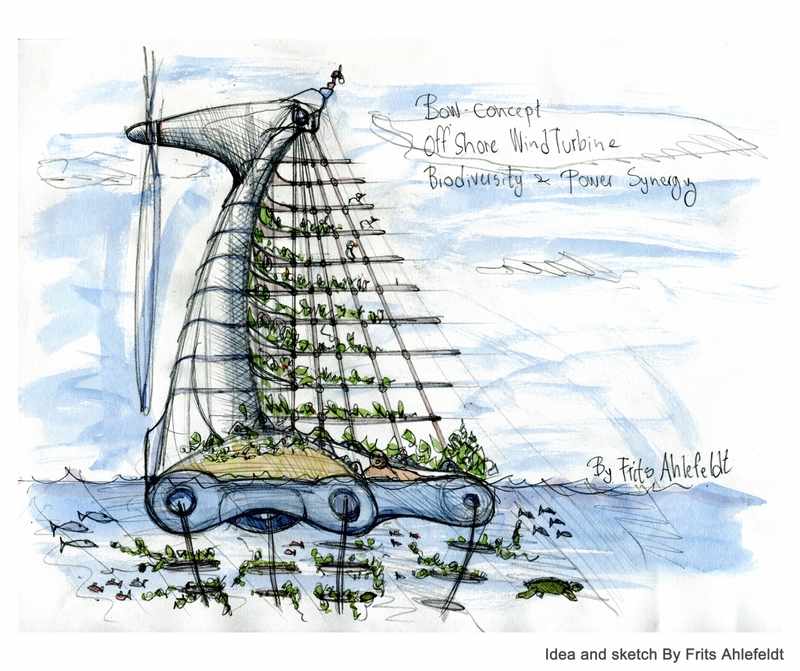 The other thing is that if something works for hikers out on the trails it might also work for a lot of other people too: both for the cities, the poor countries and the people living in nature far away from the grid in sustainable ways. 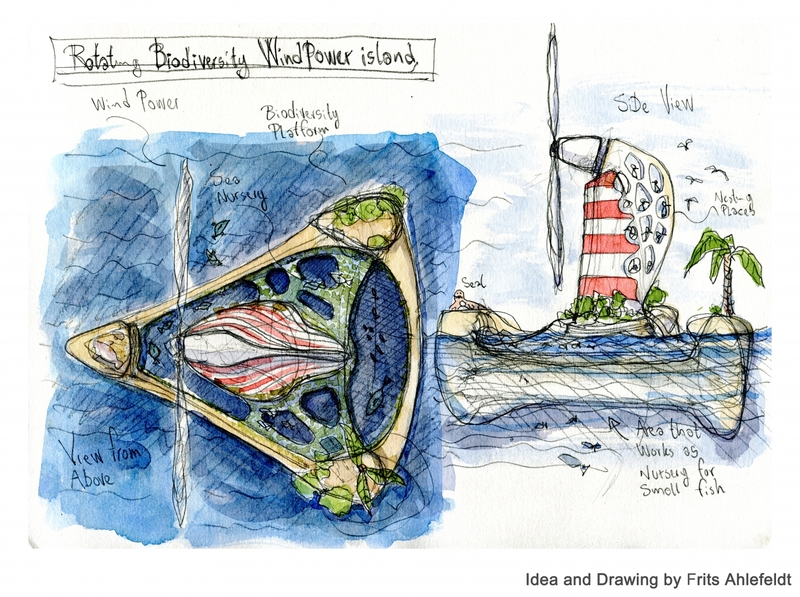 So I took out my pencil and began sketching up ideas for sustainable off-shore, biodiversity friendly wind-turbines. Structures that could produce electricity and also work as nurseries for fish, birds and sea mammals like seals and sea otters. 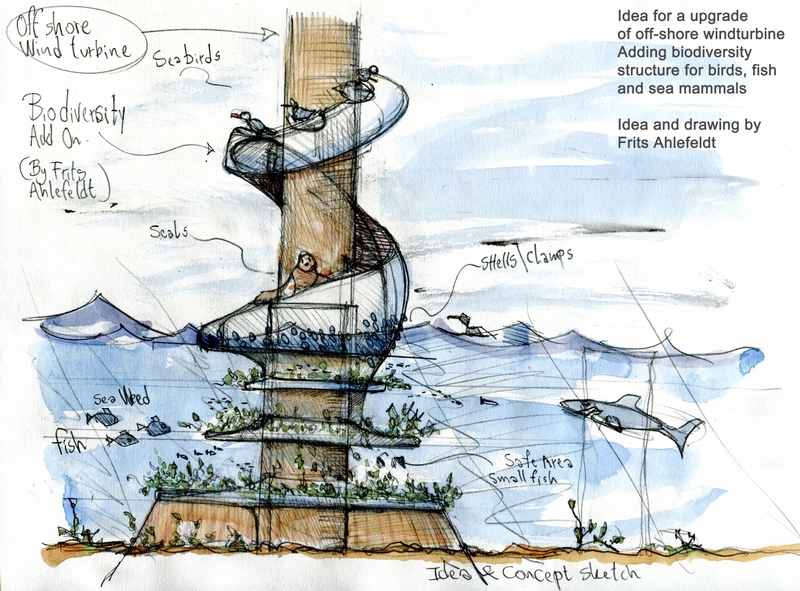 Design ideas to boost biodiversity, safety and hiking at the same time. Then I came to think of the coral atolls and lagoons, with their special protected habitat areas in a zone between the inner and outer structure. 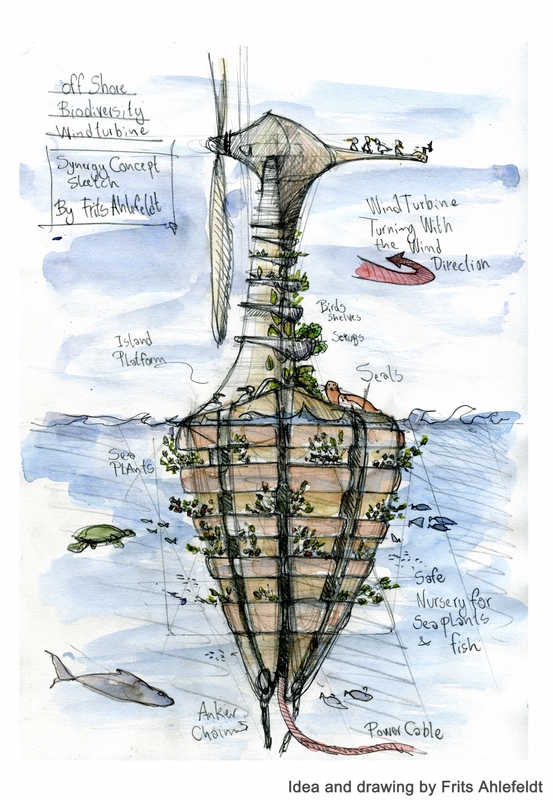 A place where fragile lifeforms and young individuals can find protection from predators and storms. 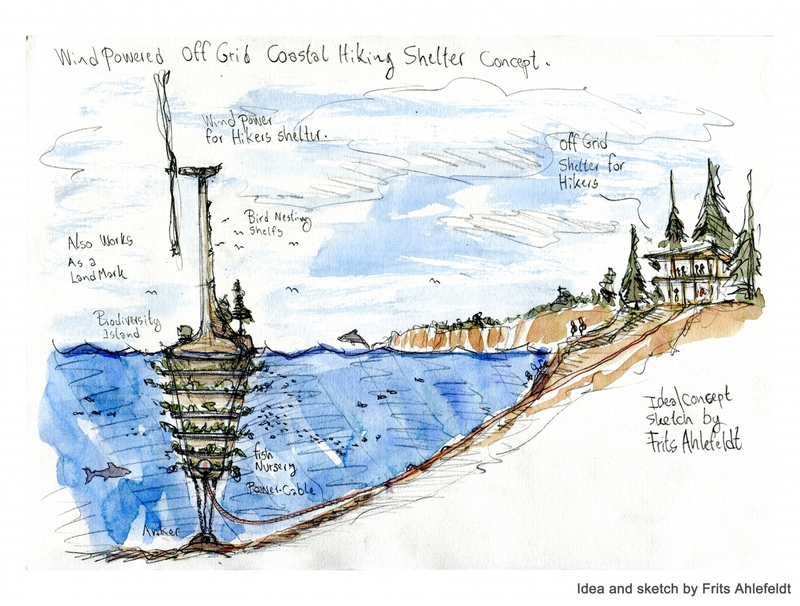 Sketched this wind turbine up as a floating build island and colored it up in red and white to make it a landmark for hikers too, so they can see where the shelter is from afar. I know there are a lot of designs for sustainable solutions, individual solar chargers, spare batteries for hikers out on the marked. But just wondered if we could design something that would make it possible to hike ultra light and just meet up with the other hikers in the evening. sharing stories and also being able to charge the digital devices that we all are getting more and more depending on. The drawings / ideas are free to use under CreativeCommons license.